St. Louis County Public Works is debuting new tools to combat icy winter roads. The new system not only reduces icing conditions, it's also environmentally friendly by reducing salt use by up to 40 percent, and saves money by reducing the amount of salt purchased. The new tools include brine-making equipment, and a new truck that features a hook lift to allow for multiple truck bodies/attachments to be used on the same chassis. The new attachments include a large tank capable of hauling and applying 2,500 gallons of brine and liquid chemicals, and a precision salt applicator. 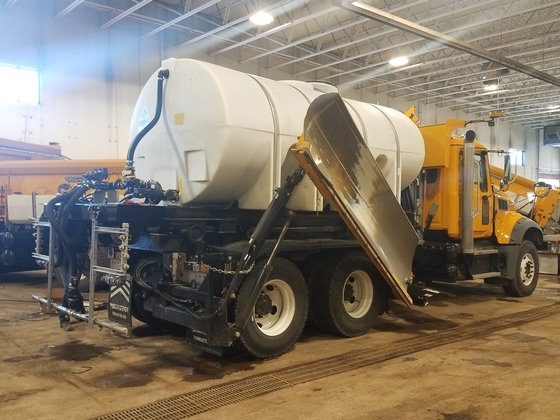 If the new tools works as well as anticipated, Public Works plans to purchase more of these direct application trucks for better coverage countywide. How it works is, Public Works crews mix and apply the brine to roads three to five days in advance of a forecast storm as a pre-treatment. The solution is applied as a liquid and dries on the roadway, after which it prevents ice and snow from bonding to the road, thus making it easier for plows to clear away even compacted snow. The new trucks will be used first on the most heavily traveled county roads, including Arrowhead, Haines, Martin and Midway, though will be sent county-wide as needed,. The new vehicle comes with a cautionary alert. Motorists should avoid passing the truck when it is in operation to avoid getting the brine solution sprayed on vehicles. The spray solution isn't damaging to vehicles, but can very difficult to clean off vehicles, and in particular - windshields. The trucks will have a sign on the back warning motorists not to pass it. The truck operator does have the ability to turn off the application - which sprays 12 to 36 feet wide - when oncoming traffic is approaching the truck. Public Works crews are currently training with the new trucks. Media are invited to learn more and watch the training this Friday, February 1, 10 a.m. to noon, as staff will be practicing in the parking lot at the Public Works facility in Pike Lake, 4787 Midway Road. St. Louis County Public Works has a new system for pretreating roads before a snow or ice storm, as well as for responding after a storm. This truck can carry a variety of attachments, and is equipped with a hook lift for quick loading of those attachments.. The other attachment is the Xzalt precision salt applicator, which will be used during and after snow/ice storms. This service is provided to you at no charge by St. Louis County MN.